Dennis Greene named himself on the bench. Boston Town picked up their first point of the UCL Premier season with a 1-1 draw against Pinchbeck United - in a game where three red cards became the major talking point. Knights manager Ian Dunn warned this Lincolnshire derby could be fiery, but all three dismissals were down to ill discipline rather than thundering challenges, of which there were plenty. The Poachers were down to the bare bones, 53-year-old boss Dennis Greene forced to name himself on the bench along with the injured Loz Lambley and Sparrow brothers, neither of who were even at the DWB Stadium. But it was the hosts who took the lead through Scott Coupland and had probably the better chances to claim three points. However, Tom Sergeant’s leveller ensured both sides went home with something to show for their efforts. While the pace of Cameron Johnson was causing Pinchbeck early issues, it was the away side who had the better of the opening quarter, Ollie Maltby firing wide when through on goal and a teasing ball into the box inches away from being converted. But that changed in the 26th minute when former Poacher Jack Smith was booked twice in the space of a minute, first for some argy bargy with Lori Borbely and then for a sarcastic clap towards the referee. Suddenly Town had the upper hand and Knights keeper Alex Smith, a late replacement for Ricky Lovelace, who was injured in the warm-up, had to be at full stretch to deny Johnson. But there was little he could do when Borbely’s deep cross dissected his defence too easily and Coupland had time to control and fire a low drive home in the 34th minute. It could have been two but Coupland, from a similar position, saw a strike rattle the inside of Smith’s post. The second half was five minutes old when Sergeant levelled with a goal which owed plenty to power and skill, and just a little to luck. His bullish run took him comfortably past Duran Reynolds and, when Jordan Tate’s challenge landed kindly, the striker smashed the ball home from just inside the box. Both sides had chances to add to the score, Coupland lashing wide and Richard Ford seeing a header well held for Town. At the other end, James Lambley, who held onto Sergeant’s 30-yard swerving dipper in the first half, was equally as alert to parry Andrew Tidswell’s free kick. 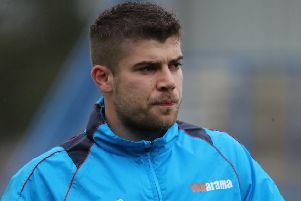 Bayliss became the second former Poacher to pick up two bookings in the space of a minute with less than 20 on the clock, conceding a foul on the edge of his box and then being shown yellow a second time for what the referee deemed to be encroaching from the dead ball. Seconds later the two-man advantage almost paid off but Reynolds’ free header rebounded off the underside of the bar and back into play. Deep into stoppage time Boston’s Ollie Pinner received yellow number two for kicking the ball away and he became the third player to end the game down the tunnel. There was still time for Smith to deny Johnson a final time, and that was enough to secure a point. TOWN: J. Lambley, Walker, Pinner, Reynolds, Turki, Ford, Johnson, Holland, Tate, Coupland, Borbely; Subs (not used): L. Lambley, L. Sparrow, J. Sparrow, Greene. PINCHBECK: A. Smith, Lawrence, Gardner (Field 90), Tidswell, J. Smith, Shiplay, Bayliss, Wright, Maltby, Sergeant (Clark 73), Ogden (Dunn 89).